Bespoke Wedding Cakes are for those who require something a little more special, grand or intricate. Cakes that are unique in design and detail and which require the highest level of skill in sugar craft. 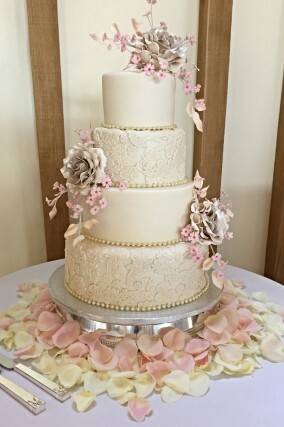 Creating beautiful wedding cakes requires skill and experience and Karen and her team have a wealth of expertise in designing and assembling showstopping creations. Many of the most beautiful cakes Karen and Julia have created have been inspired by there Brides. We adore the creative challenge of bringing your dreams to life, taking inspiration from your wedding day ideas and themes to produce your perfect, one of a kind bespoke design. She is very proud of her reputation for creating outstanding cakes to the very highest standard for clients including royalty. If you would like her to create something entirely unique for you, please book a one-to-one consultation after which Karen and Julia will prepare design sketches and samples with a full quotation for your approval.